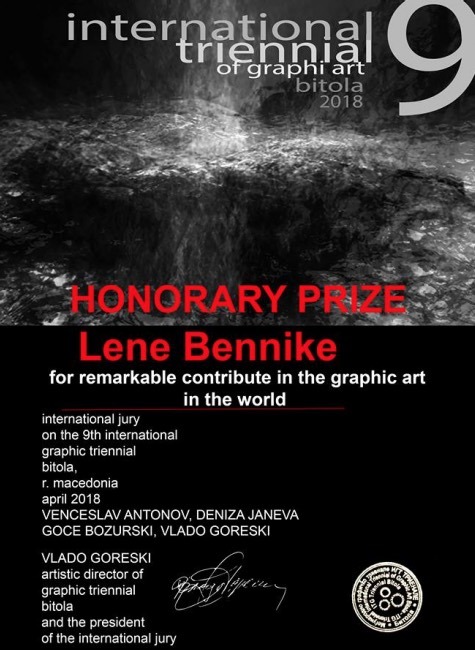 Gratefuness is the feeling that permeates my entire being after having received this Honorary Prize by the jury at the above Triennial of Graphic Art in Bitola 2018 presided by Vlado Goreski from Macedonia. "The graphic triennial is conceived and has the concept as an anthology of sincerity, sensibility, existence with a spiritual ideal honest and dedicated to creativity and art. Our awards are given for honest, consecrated, true existence with art. art, which is outside of time and always close to the immortality of the human heart, emotions and soul. The jury decided, from the heart and unanimously Special Award that you will be given to you personally by Honorable 9. The graphic triennial is conceived and has the concept as an anthology of sincerity, sensibility, existence with a spiritual ideal honest and dedicated to creativity and art."